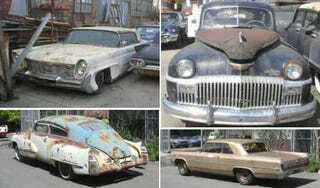 While Bumbeck's feverishly searching for sub-$1000 post-apocalyptic project cars on Craigslist LA, I do the same on the San Francisco CL listings. This listing has been around for a while; I suspect the slightly-steep prices are subject to negotiation by now. So far I haven't called the guy, in spite of the fact that the cars are located within thrown-rod distance of me, because I keep telling myself — with decreasing conviction — that I can't take on some impossible-to-find-parts-for car project. But, in the name of all we hold holy, imagine having a '56 Ford Mainline with a 460 plucked out of a junked Continental! You could knock the ladies dead by saying "Wait here, dollface, I'll pick you up in my Mainline." Or a '47 DeSoto with suicide doors? Or, also in the name of all we hold holy, a '54 Hillman Minx?